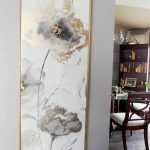 Home » Decorating » How to Wow Your Front Door Decor Now! How to Wow Your Front Door Decor Now! Kiss the winter blues goodbye and jump head first into spring with this easy DIY front door decor. Bonus it cost me a little over $100 to bring this colorful space back to life. 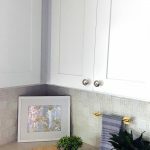 The project is delightfully finished because a few bloggers challenged me to “Spring into Action” and get a project done I’ve been putting off. A bunch of us put the finishing touches on our projects and today is reveal day! If you’re coming over from N’Ckyola’s at 4th House on the Right , welcome! I had PLENTY of projects to choose from. I contemplated finishing up the kitchen. Lord knows I was supposed to be done by now. But after a lighting fiasco, I put that on the backburner to let some ideas simmer for a bit. With on a few short weeks to deadline, it took me way too long to decide on a project. But one day I happened to walk through the garden section of Walmart, I ran into some outdoor pillows on clearance for $3. I snatched them up. A few days later I ran in again and moseyed on over to clearance plants and found trays and trays of bright beautiful flowers marked down to 39 cents. I think Wally World was speaking to me. When I brought the plants home and looked at my sorry porch area, it was a no-brainer. Whip this little area into shape. This post contains affiliate links. If you click on a link and make a purchase I earn a small commission to help me run this site at no cost to you. Read my full disclosure here. My first line of business was to cut back the overgrown palm trees. They are gorgeous, but I hadn’t trimmed them one time during the winter and we could barely get in the front door without swatting the fronds away. I trimmed the trees, cleaned the trunks a bit, pulled weeds and added six bags of red mulch. Walmart clearance was GOOD to me. I spent about $30 on plants and got enough for this area, the other side of the house, my back patio AND a few indoor beauties. I even scored two-amazing snake plants for $5 each. I found the bronze ‘planters’ at Ross. They’re meant to hold faux plants indoors. To weatherize them, I added a clear coat of Rustoleum and drilled a hole for drainage. Instant outdoor planter. Using all the planters I rounded up from Dollar Tree, Ross and Old Time Pottery, I made a few colorful arrangements. Never skip the clearance area of any store. Even in if the plants are a little worn, you can probably bring them back to life. That along with the pillows made a major statement. Honestly, I could have left it at that and called it done. (and refinished the table, of course) But I really wanted to add a layer of sophistication and coziness to this little front patio area. Lem (the hubby) and I love to sit on the front porch and watch Jaylin (the kiddo) play or just relax. In the summer we just run for cover. It’s way too hot. So, I decided to make a mini outdoor living space. I scoured every local and online store for the perfect sofa table/plant stand. I wanted this one but it wouldn’t arrive in time and ended up buying this one from Lowe’s and gave it a spray of bronze paint. I styled the plant stand with my clearance flowers, a DIY solar lamp (here’s the tutorial on how to make this awesome lamp) and some lanterns I had on hand. The lanterns were another clearance find at JoAnn’s. I also had to sand down the table and refinish it. Rather than just paint it, I faux-stained it by using a little bit of brown outdoor paint mixed with water. Two coats later and she was good as new. For the front door, I simplified my wreath a bit with ribbon and a few colorful spring ranunculus stems I picked up at Michael’s. I tried to use one of those modern thin wreath forms for this, but it just wasn’t weighty enough for the door…I ended up just adding new ribbon to the old wreath form. A new rug, a little cleaning and lots of spray paint and I’m over the moon glad to call it done! I did go over budget. My plan was to only spend $100. That table put me at about $125, but I’m not sorry. I love it. Now hop over to Arie’s House where she’s done a Master Bedroom refresh! You can also follow the hashtag #springintoactionbloghop on Instagram. Want know how to decorate your home for FREE? I love the way this turned out Kenyatta. And your photos are spot on! Great job here. Thanks Ola, I LOVE how this turned out. Driving up to the house looking at all that color is great! I love the colors! It’s inviting and screams spring. I like the small details that puts it all together. I would sit there… & take nice spring photos lol. Thanks Tara. I’m so glad I went with the colors instead of going for neutral like usual. lol. This is so pretty. And just in time for Spring! The $25 over budget isn’t bad AND looks like it was totally worth it! Thanks! the $25 “splurge” was certainly worth it! Welcome Jamala! I’m looking forward to getting to know you! I don’t think I’ve ever seen an outdoor lamp like that with a shade. I also adore your wreath. Its so good. Wonderful job. Thanks Carla. That lamp was super easy to make and finding the shade was a happy accident! This is all so pretty and full of life. All the flowers make your porch look a million bucks. Love the small projects you did that made a big impact. Budget decorating for the win! Awesome. Thanks. The flowers are so pretty that using them almost felt like cheating! LOL. Let’s hope they can survive the brutal Florida heat and sun. So fresh, inviting and regal! Love it! I see you replaced the original bird pillows. I do like those too, where did you find them? Thank you Darlene. I got the pillows at Walmart a while ago. They were also $5. Gotta love that price! Gorgeous update! I’m seriously going to check out Walmart and Ross! Just have to leave a note so you know that you inspired me! I love everything you did to spruce up outdoor area. Everyone needs a little peaceful space where you can relax and enjoy the outdoors. Yay! Hopefully, I’ll get to check out what you do with your outdoor area! What an inviting view to come home too… It looks so great! I agree on the clearance section… I’ve found some good plants at Walmart that same way! It is so nice to pull up to all that color! What a cute and cozy little space! We don’t have a front porch, and I have wanted to fix up something like that in place of our flower bed in front. Of course, we live in Montana, so no palm trees! Anyway, thank you for the inspiration! You’re welcome Cherryl, I have no idea really what this little area should be called. It’s not exactly a porch. Seems way too big to be a flower garden. LOL. I’m just happy to have it. I wish I could ship you some palm trees, but alas the climate won’t allow it. But I’m sure your space will still be beautiful! Kenyatta, wow – you’ve spruced up your outdoor space so much for a small amount of money. It’s so inviting and cozy. I really just want to hang out with you while we sip on cocktails or coffee. Can we schedule that? Ha…seriously it’s beautiful and I love the bright colors…perfect for spring. It’s so chic and colorful that I want to redo my porch and sit out there all day! I could not agree more about the clearance section either. You can often find some real decor gems in there. I think my favorite piece is that plant stand you got from Lowe’s. Hopefully, you can enjoy that space pretty often. The weather where I live is crazy right now! It keeps changing from warm to cold, so I don’t think spring can make up its mind. 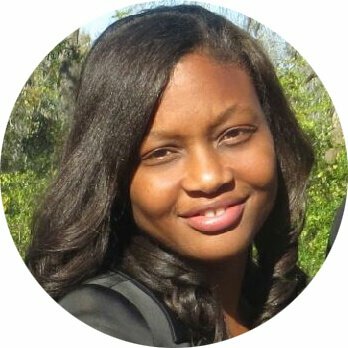 Hey there, I’m Kenyatta, a self-proclaimed Home Décor and DIY enthusiast. I teach DIY decorating based on my simple core values-my rules of life. I'm a gutsy girl with a tiny home, a tiny budget, but enormous dreams and high style. I'd love to share this life journey with you. Laugh with (or at me) but leave with nuggets of wisdom that will last you a lifetime. Sign up for the My Design Rules newsletter and never miss a post. DIY Canvas Frame-Upgrade your art on the Cheap!